Dynamics Therapy Centre for Kids is a leading paediatric therapy centre for children located on Orchard Road in Singapore. We provide client-centric and evidence based therapy, intervention and educational services in a manner which is accessible, comprehensive, and cost-effective. Our services include Speech Therapy, Occupational Therapy, Psychological evaluations and intervention, Social Skills training, Educational Therapy, Physiotherapy, and an Early Intervention Program. Please visit our website regularly to stay updated with our events. We encourage involvement from parents, and encourage them to take part in sessions whenever possible. We understand that juggling the little ones and their schedules can be tough and that is why we are an Allied Health Practice that has all services under one roof. We have a wonderful team of customer service officers that have been trained to help you with your queries and schedules. When we started out in 2005, therapy services where in severe shortage. Parents were required to wait for months or even years for their therapist of choice. We are committed to ensuring there are no waitlists, by hiring more therapists to meet demand from our clients. Our client's needs come first. We individualise goals which are SMART (Specific, Measurable, Agreed upon, Realistic and Time-Based) for every child. Goal directed therapy is key to achieve progress and reach optimal progress and potentials. For clients which require multiple services (e.g. both Speech Therapy and Occupational Therapy) we provide the convenience of one location for all services, as well as the guarantee of a coordinated effort between the professionals working with the child. We recruit therapists from Singapore, USA, United Kingdom, Australia, New Zealand, and Ireland, among other countries. We make sure to recruit the best therapists, and create for them an environment where they enjoy supervision, team support, and additional training and learning. This allows our therapists to provide a better outcome for our clients. Having a large pool of therapists allows us to have economics of scale in terms of our investment in assessment tools, games, therapy equipment, and technology. We even develop our own materials, informal assessment tools and iPad applications; all to ensure customised and effective therapy delivery to our clients. We provide customised intervention programs for each and every client. These are tailor-made to each child based on assessments and observations. Our therapists are trained in a variety of approaches and methods to allow them to choose and apply the best one based on the client’s needs. We also develop individualised goals, both short term and long term, so that all therapy and intervention is outcome-focused. Goals are developed based on the assessment done by the therapist and based on parental concerns. We take pride in being able to achieve goals, and once these are reached, we either discharge clients or establish new goals. Having served thousands of clients from Singapore and around the region, we have a developed a deep understanding of their needs. This includes understanding their schooling environment; be it MOE, Special Schools or one of the International Schools such as the American, Australian, Canadian or Tanglin schools as well as many others. Our therapists regularly visit schools for our clients and are in touch with teachers at the schools. They understand the way each respective school operates and how to help our clients meet the school requirements. Our therapists also work closely with other professionals from other organisations to achieve the best outcome for our clients. Our primary clients are children, and we realize the important of safety and hygiene. We have a dedicated full time (Singaporean) cleaner to ensure all therapy rooms are cleaned and disinfected daily. Do you need a comprehensive assessment? Call us and receive the help your child needs. Check out our helpful handouts and brochures! Our company's mission is to deliver early intervention for children, using a multi-disciplinary approach. We provide Occupational Therapy services in a Sensory Integration framework, Speech Therapy, Psychological assessment & intervention, Art Therapy, Remedial Teaching, Social Skills Training, & Structured Teaching. Our company's mission is to deliver early intervention for children, using a multi-disciplinary approach. We provide Occupational Therapy services in a Sensory Integration framework, Speech Therapy, Psychological assessment & intervention, Educational Therapy, Social Skills Training, and Structured Teaching. We also run a 5-day-a-week Early Intervention Program. For more information, please click on the respective logos for more details. 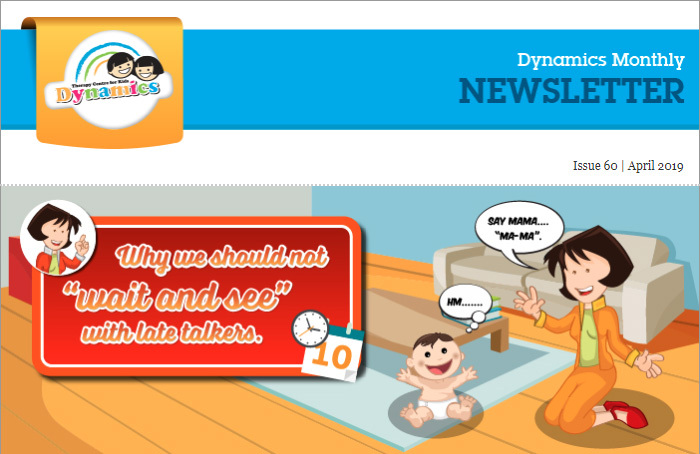 Copyright © Dynamics Therapy Centre for Kids Pte Ltd. All rights reserved.